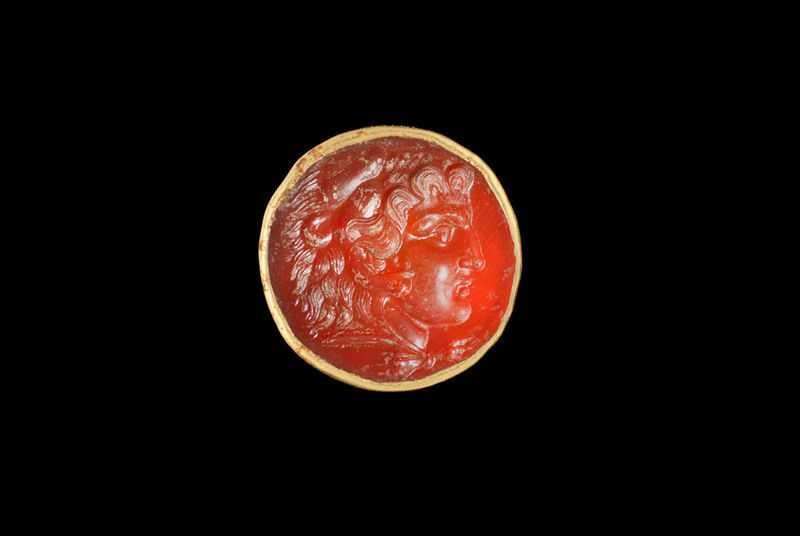 LONDON.- Bonhams next sale of Antiquities on April 13th includes three powerful images of Alexander the Great - a 2000-year-old ring bearing his image and two stunning sculpted heads from the same era. The first sculpted head of Alexander the Great is Roman from the Antonine dynasty, circa A.D. 138-161, it is over-lifesize. He is depicted with distinctive wavy hair falling at his furrowed brow and the nape of his neck, his brows carved in relief with notched details, the lidded eyes with incised irises and drilled pupils, his shapely lips above a strong chin. 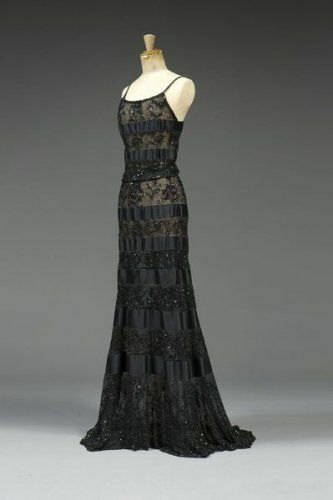 It stands 12½in (31.7cm) high, and is estimated to sell for £150,000-200,000. 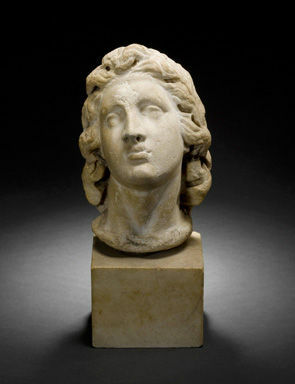 Clearly identifying this marble head as a portrait of Alexander the Great (366-323 B.C.) are his characteristic idealized facial features and distinctive "anastolé" hairstyle, with a wavelike formation of locks over the forehead. Although a number of images of Alexander were made during his lifetime, most of these Greek originals have not survived. The vast majority of his portraits that have come down to us are Graeco-Roman copies, adaptations, and transformations in all media (bronze and marble sculptures, paintings, mosaics, coins, gemstones) that reflected lost Greek originals. These Graeco-Roman images were produced throughout Rome's empire from about the 2nd Century B.C. until late Roman antiquity because Alexander had captured the imagination of Rome's great military men and statesmen, who wished to emulate Alexander and his deeds in one way or another. Some of Alexander's original portraits were even brought back to Rome to adorn the city. There are many examples of Alexander's image being recalled by Rome's leaders including Pompey, Julius Caesar and Caligula who was said to have worn a breastplate that once belonged to Alexander. Other emperors, too, imitated or emulated Alexander in various ways. 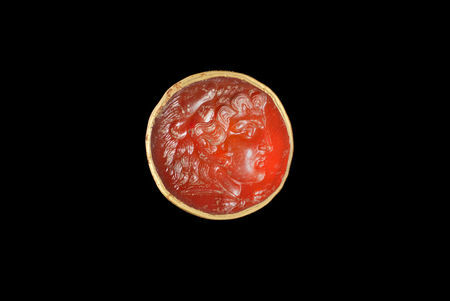 The third Alexander-linked object in the sale is a Hellenistic gold and carnelian intaglio ring of Alexander the Great Circa 2nd-1st Century B.C.. A flat circular stone engraved with a profile head of Alexander the Great in the guise of Herakles wearing the lion's skin, the jaws pulled up over his head with the paws tied at the neck, set in the original gold ring, the hoop flaring at the bezel. 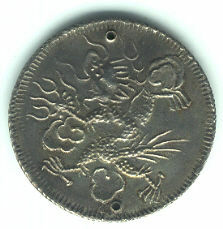 It is estimated to sell for £40,000-50,000. A roman marble bust of an athlete. circa early 1st century a.d.